Stocks are rising on Wall Street Friday, reversing a three-day losing streak amid renewed optimism of a potential resolution to the U.S.’s trade war with China. 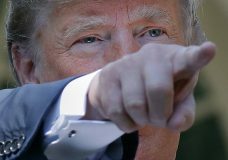 WASHINGTON — President Donald Trump inaccurately described his new trade deal with Canada and Mexico as the biggest ever — it’s not even close — and glossed over some possible consequences of the agreement, such as higher car prices. WASHINGTON | U.S. President Donald Trump formally withdrew the United States from the Trans-Pacific Partnership trade deal on Monday, distancing America from its Asian allies, as China’s influence in the region rises.